The one proviso is that you must already be getting a goodly number of visitors. This affiliate tool is for monetizing your blog, not for getting you footfall. 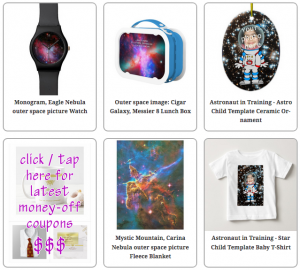 The earnings come from you illustrating your blog posts with products from Zazzle’s vast storehouse. When we say vast, we truly mean it! Zazzle has millions on millions of product / design combinations from tens – hundreds – of thousands of dedicated independent artists. Since they cover every subject niche imaginable, there’s bound to be at least one for your blog! We’ll list the things that makes NiftyGridZPro the right one for you and then cover them off as we go, or expand on them later on in the article. So keep reading! Zazzle has already, and continues to spend millions of dollars raising brand awareness. You can be sure a goodly proprtion of your visitors will already perceive them as a trusted brand in their own right. And anything that smooths the flow of see-click-purchase is a boost! If you’re a bit of a fashionista, then Zazzle has all the trending hotness you can imagine. Elle Magazine has “red” for the trending fall color (at the time of writing), so that’s what we’ve used for the grid shown. 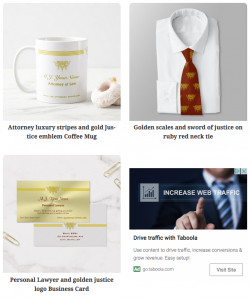 We used more shortcode options to draw out the most popular red fall wedding items on Zazzle right now – yes, at the time you’re reading this post! We’ll give you the shortcode we used in a moment but let’s continue first with the idea. 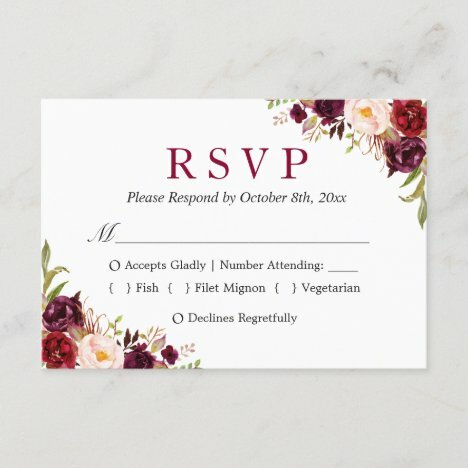 So you write an article about, let’s say, planning for and having a wedding this fall (ok, it’s a bit late for that but you get the picture). When the time is right, drop in a grid. Like in this paragraph. Note we’ve taken the precaution of setting the maximum size of the grid cells small enough so that it still looks good on mobile. To make it work nicely, embedded in the paragraph like it is, we did this. We switched off the product titles (by the cunning move of setting their size to 0) and we switched off the description text by setting its length to 0. Part of keeping a visitor engaged and making your site appealing is for you to speak to your visitor from within the content. Sure, you communicate special offers and make announcements in your header, sidebar or footer – but everyone does that. When such communication speaks from within your content, you can get even more engagement. This affiliate tool lets you do just that! When you use the injection options, one slot / cell within each product grid is chosen at random to display your message / ad. NiftyGridZPro lets you control the injection of your own home-grown ads or promotions, or even Google ads. You control it all in real time from your admin settings panel, where you also set up ad rotations and priorities. With it being in real time, you get tremendous communicating power. You set a new promotion message and link (with its own tracking code), hit the save button and all grids across your entire site will start displaying it to visitors – right away. A/B testing was never easier! As well as its main .com site, Zazzle has a domain for many major countries. Visitors to those domains see everything in the local language, with prices in the local currency. As a result, visitors from those countries are much more likely to buy from their local domain. Zazzle and the various country tax systems encourage that behaviour. There’s a barrier to earning here but we have an answer! The barrier? If an affiliate refers someone to the .com domain but they end up buying from their local domain, no referral is earned. To compound it, not all products (esp. edible ones) aren’t available outside the US. 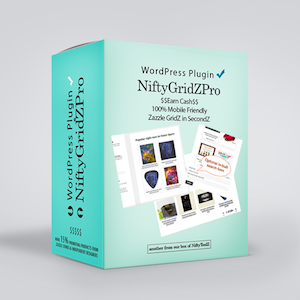 So to banish those barriers, uniquely amongst Zazzle affiliate tools, NiftyGridZPro gives you the option to switch on local domains. It’s a bit time consuming interrogating Zazzle for product availability, so the feature is auto-limited to grids with fewer than 10 items. Here’s how it works. NiftyGridZPro determines the geographical location where a visitor is browsing from and looks up the Zazzle domain for that country. It then swaps in the local country domain for all Zazzle links. There’s lots of how-tos, FAQs and tutorial videos to help you with any aspect of using NiftyGridZPro. Get Your Premium License Now!